Planet Hell: Now Playing - "Yo-ho-ho, and stuff!" Now Playing - "Yo-ho-ho, and stuff!" I really like the way that FFV is quite funny and tongue in cheek at times, there are some awesomely quotable lines in it. It kinda sets it out for me so far from the other games. 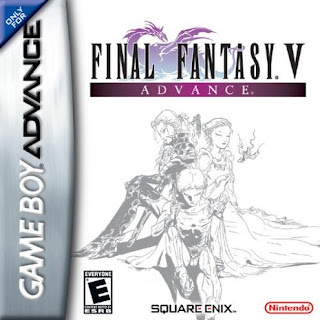 I'm quite a fan of the original few Final Fantasy games (I-IV, with II as a potentially weak link) and as such I admire the old school appeal and the job system in it (there are more jobs than I can shake a stick at) So far, a few bosses have been mildly challenging, although I've not had a game over screen or anything yet. When I last played Riviera, I didnt have any game overs the whole way through, and I came close to that in Chrono Trigger. I mean, maybe they aren't the most challenging games, but I'm proud of that! heheh...I died a few times in Symphony of the Night, which I beat, but only with the first ending-I'm sure there is more to do, but I couldn't figure it out what to do. Recent Purchases ~ J-culture ftw! Yahoo Answers - "How is babby formed?" Now Playing - "Its a Trap!"